On the 23rd (Tue), take a stroll through Christ The King Cathedral, then trek along Chandigarh Fitness Trail & Flower Garden, then see the interesting displays at Government Museum and Art Gallery, and finally contemplate in the serene atmosphere at Golden Temple - Sri Harmandir Sahib. For photos, traveler tips, more things to do, and more tourist information, go to the Chandigarh trip builder site . Finish up your sightseeing early on the 23rd (Tue) so you can travel to Dubai. 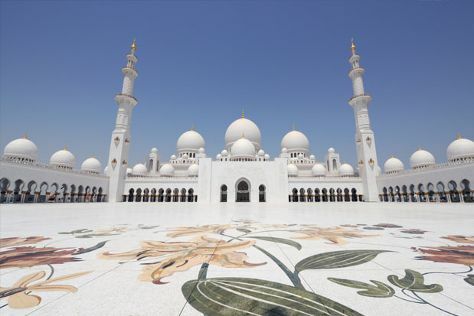 Visit Sheikh Zayed Grand Mosque Center and Heritage Village for their historical value. Step out of the city life by going to Jumeirah Public Beach and Umm Suqeim Beach. Step out of Dubai with an excursion to Emirates Palace in Abu Dhabi--about 2 hours away. Spend the 25th (Thu) spotting exotic species with a safari tour. There's lots more to do: take an in-depth tour of Al Fahidi Fort, take in panoramic vistas at Burj Khalifa, and make a trip to Sheikh Mohammed Centre for Cultural Understanding. For ratings, where to stay, traveler tips, and more tourist information, read Dubai trip builder site . Getting from Chandigarh to Dubai by flight takes about 7.5 hours. The time zone changes from India Standard Time to Gulf Standard Time, which is usually a -1 hour difference. Expect a daytime high around 39°C in April, and nighttime lows around 28°C. Wrap up your sightseeing by early afternoon on the 27th (Sat) to allow time for travel back home.